« Rounding up the Reaction: Cuomo’s plans are going to cost how much? Try as we might, we just cannot ignore the looming effect the MTA’s post-Sandy Fix & Fortify work is going to have on the L train. Nearly one year to the day since we learned that repairs to the Canarsie Tube will cause years of pain for L train riders, Gothamist’s Christopher Robbins dropped a bombshell. According to his sources, repairs on the Canarise Tube could take up to three years, and the MTA is considering a full shutdown of the L train between Brooklyn and Manhattan for at least part of that timeframe. But the bad news may be tempered slightly. According to MTA sources I spoke with after the Gothamist report was published, a full shutdown of service wouldn’t last three years. That’s the long-term timeline for all work if the MTA repairs only one tube at a time or otherwise splits up service shutdowns. The MTA feels a full shutdown would last longer than one year — and perhaps up just under two — but the agency is now trying to figure out how best to get in, get out and gone it done. It is, after all, the new mantra driving rehabilitation work. So far, the worst of the Sandy work that New Yorkers have suffered through has involved subway lines with nearby redundancies. The R train’s Montague St. 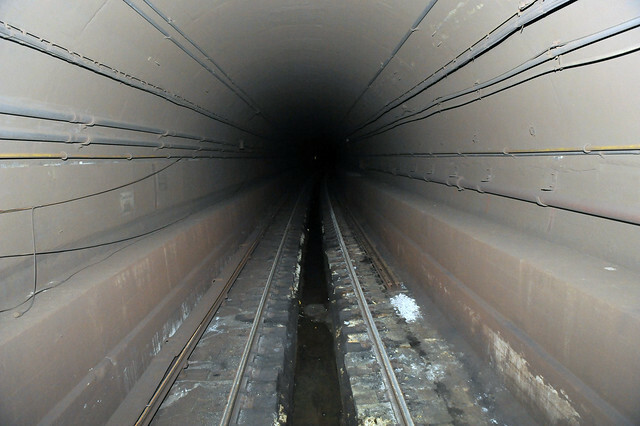 Tunnel served only 65,000 riders per day; the A and C can run through the F train’s Rutgers St. tunnel on weekends while their own Cranberry Tunnel is repaired. The L train though serves the second-most riders of the East River crossing into Brooklyn and for a large bulk of those passengers — the ones who live in Williamsburg and Bushwick — options are very limited. Riders who can access other lines should and will. Anyone south of Broadway Junction can take the A or C or J or Z. Anyone near Marcy Ave. can take the M train. Those who lose out most are the ones boarding at stations that have seen more growth in ridership than any other set of stations in the city, and that’s a large portion of those 230,000+ daily crossings. …the MTA is going to have address what promises to be crush crowding at Court Sq. as Northern Brooklyn residents head to Queens’ subways to reach Manhattan. Citi Bike should be up and running in Bushwick, and DOT should ensure the Pulaski Bridge bike lane is open. The city should consider making the Williamsburg Bridge bus only or at least reserving a lane in each direction for a constant stream of shuttle buses. And the city should do what it can to ensure that residents in Williamsburg who would otherwise take the L can access ferry service. Although I’m generally a ferry skeptic, this is a clear time and place where ferry service can help. Already, Williamsburg residents are worrying about the plans. NY1’s Pat Kiernan put together his proposal for a one-track shuttle — though turning Canarsie-bound trains becomes a potential problem in his scheme. Others are fretting about the end of Williamsburg and a collapse in the Northern Brooklyn scene. Others know this hurts less affluent areas as well. There is simply put no good option. I have no answers right now. This story will unfold over the next 18 months. But one thing the MTA should do is get out in front of it. The agency plans to work with the communities affected by this shutdown “soon,” per the press office, to discuss proposals and present the pluses and negatives of each plan. This planning process should be very public. After all, the MTA is dealing with a situation where they have to get a few hundred thousand people into Manhattan via alternate routes that aren’t exactly teeming with capacity. But they’re thinking about it. I don’t envy the person who has to tell everyone what they ultimately decide. It’s a small consolation prize too, but hopefully, when the L reopens, it’ll include more entrances at Bedford and a staircase at Ave. A. All of that work requires significant service shutdowns which, thanks to Sandy, are coming. Senator Schumer is trying to get federal funding, and he’ll have to work to ensure the dollars materializes in time. If there’s a window, no matter the circumstances, the MTA should capitalize on it. With the 2av line (presumably) open, hopefully they send night and weekend M trains to 96th to turn around rather than at 57 and cause backups for the F.
Too bad these improvements wont include a station at Ave C, tail tracks past 8th av or 10 car platform lengths. That would make a disruption more tolerable. That is EXACTLY what I would, with the idea of having the (M) go to 96th/2nd on weekends and/or late night to supplement the SAS, when fewer trains overall are operating and delays (with switching) are not as likely. That morphed (after discussing it elsewhere) into an idea of an “Orange (T) ” to 96th/2nd that on weekdays would be a supplement to the (M) along its regular route to 47-50. then running with the (F) to 63rd/Lex and then with the (Q) to 96th, while on late nights and weekends, this would be the line from Metropolitan to 96th/2nd, replacing the (M) during those times where the (M) would normally be running. Orange (T) being a supplemental line (most likely 5-6 TPH) between Metropolitan Avenue and 96th Street-2nd Avenue on weekdays while on late nights and weekends, replacing the (M) on the Broadway-Brooklyn line as this line would be running 24/7 (most likely 6 TPH on weekends and 2-3 TPH late nights). That to me solves the issues here, especially during the (L) shutdown with the option of making the “Orange (T) ” permanent once the (L) shutdown ends. Will the L train still be running from 1st to 8th avenue? If both tubes are shut down, no, as there will be no way to get the Manhattan shuttle trains to the yard for maintenance. The only track connections from the L to yards are at Broadway Junction and Canarsie. Boy… They better open that exit at Hewes Street and create a MetroCard Transfer between the BMT Jamaica and IND Crosstown Lines. This all highlights the problems caused by having competing private (and 1 public) interest running transit way back when. The lack of station and track connections as a relic of 80-100+ years ago still haunts us today through a lack of redundancy. Imagine having an easy connection from the G to the J/M/Z and all the lines at Atlantic as well as the A/C. Imagine the G having an easy track connection to one of the routes into Manhattan. These are things that, at the time of construction, would have been relatively simple to do with some minor changes to routing. But you had three competing organizations who had an interest in NOT making it easy for passengers to move between lines. There are lots of areas where competition is good, but this is not one of them. The G could’ve had a route into Manhattan regardless, since it connects to an IND line at both ends. It was purposefully left out. The real missing piece of transit infrastructure here is an east river crossing somewhere between 14th and Steinway. There never was a plan to put an East River crossing between 14th St and Steinway. However, there were plans to put 2 East river crossings below 14st (Houston Street to South 4th Street shell and Worth Street to South 4th shell, both of which are apart of the IND Second system plans). You know that BOTH systems benefit from transfers? A transfer isn’t one way. A transfer makes the line more useful, and brings in more customers. People like to talk about interstate rail doing the same thing, which is absolutely false – you just have to look at the number of “Union Stations” in the US – a union of two independent private companies, meeting at the same station, to exchange passengers. Because guess what – people transfer both ways! Transfers make for better routes and more riders – meaning more profits for both companies! I’m wondering why can’t the MTA simply create a new limited stop bus line that stops/starts at the Bedford Avenue station in Brooklyn travels non-stop over the Williamsburg Bridge with a quick trip along 14th Street with either Third Avenue or Union Square as the last stop of this bus line. Just run this bus route 24/7/365 for the duration of the tunnel closing, with appropriate time schedules, etc. for the L-train riders. This kind of a bus route would have a known travel time – which would help riders figure out their schedules. This action plus the transfers to other lines such as the M-train, the A, C and J trains would really help riders, as well as the usual 14th Street cross-town buses, and the L-train running as a short shuttle from 8th Avenue to 1st Avenue under 14th Street. If one wants to keep it simple, just use one full-length train on one track traveling back and forth during the late nights. It takes 3.5 seconds to load a passenger into a bus without fare collection. It will take 87.5 seconds to load each bus through its two doors (58.3 seconds for 3 doors). There are approximately 20K passengers peak hour (8-9am) crossing from Bedford to First Aves. At 50 passengers per bus that comes to 400 buses during the peak hour. That’s one bus every 9 seconds. This means that 10 buses need to be loaded simultaneously in order to maintain the 9 second headway. The buses will have to stop for traffic lights. A 45 second long red aspect will result in 5 buses backing up. A following bus will not start until its leader has opened up 1 bus length. This means the leader must travel 2 bus lengths (80 ft) to open up this gap. It will take the leader 5.5 seconds to open up this gap. The leader will start at t = 0 and the fourth and last follower at t = 22 sec. This will leave only 23 seconds of green aspect for the following buses to approach this block. Only 2 buses will be able to enter the block during the green aspect interval. However, 5 buses were required to maintain the 9 second headway. Stopping for traffic lights and allowing cross traffic means a single bus lane will provide only 40% of the required capacity. This assumes there will be no traffic in the bus lanes. That’s only the peak hour. There are 12K passengers the previous hour and 16K passengers the following hour. Conclusion: buses on a dedicated bus lane cannot hack it. Are you making the argument that because the bus can’t handle 100 percent of the load, it shouldn’t be implemented at all? A dedicated bus lane is part of a solution; it’s not the only solution. The ADA crowd could use a bus from Mrytle to Manhattan, I guess? No ADA stations between Myrtle and Union Square. Would have to travel down Roebling inbound and Hevemeyer outbound, at least to get on/off the bridge. Could cut over to Driggs/Bedford (The Bedford stop has an exit at Driggs anyway). I interpreted his remark to imply that dedicated, non-stop, bus lane protected, bus service would be able to handle this emergency by itself. My simple sanity check revealed that it is a 40% solution at best. Cost also plays a part. This 40% solution also requires 400 extra buses, which the MTA does not have. Their cost is $200M @ $500K a pop. Their other cost is that the 10 buses that are always loading at Bedford Ave effectively preclude any other surface operations from taking place. That leaves the remaining 60% without a surface option. That should give any logistics planner pause before suggesting a single bus shuttle operation. I’d suggest a realistic solution be thoroughly vetted before a complete shutdown of the 14th St Tunnels are contemplated. That vetting should start with a simple sanity check like the one I used for using a bus shuttle. Understand that I understand the point that you are making. I was never suggesting that such a limited stop bus line provide the “complete replacement” of the L-line between Manhattan and Brooklyn, but as one of the components. For example, at Broadway Junction L-train riders could and would be “strongly urged” to transfer to the A, C, J and Z trains. Again at Myrtle Avenue L-train riders would again be “strongly urged” to transfer to the M-train. Then again, at Lorimer Street/Metropolitan Avenue L-train riders would again be “strongly urged” to transfer to the G-train. So that by the time L-trains reached Bedford Avenue, the numbers of riders using the limited-bus I proposed would be reduced – still large numbers of folks but not the full load of the L-train. I was never suggesting that only “one thing” be done. Again, I do understand that we’re talking about huge numbers of folks, and that managing and transporting huge numbers was never going to be easy. Here’s one problem. The alternate routes must add trains to their runs to accommodate the additional L train riders. The L operates 20 trains to Manhattan between 8 and 9am. They also operate 14 trains between 7 and 8 and 15 trains between 9 and 10. That’s 39 peak period trains that the MTA does not have. If they had them, where would they run them? The Cranberry St Tunnel is already closed weekends due to Sandy repairs. It’s already operating 24 tph peak. It does not have much wiggle room for expansion. That leaves the J/M/Z which operate 20 tph over the WB. Its expansion capability is limited by weight restrictions on the WB. Remember, the towers are bowing towards one another because of the weight of the trains. Cranberry is operating 26 peak period trains. Theoretically, you are going to try to get as many people onto the M and G lines as possible. M service is going to be hamstrung by the flat Junction east of Broadway/Myrtle, and the G doesn’t go into Manhattan. Lines at the southern end of the G route could probably handle additional traffic (Cranberry’s trains are not exactly crush loaded at this point in time). But it’s the lines at the northern end of the G that are probably most useful, and it’s these lines that are probably least able to soak up additional riders. I suppose beefing up M ridership would serve L riders on both ends. There’s nowhere near enough room on the existing A and C trains to absorb any significant number more transferring passengers from the G (or L at Broadway Junction). This is going to be messy, as sure you can add cars to the G, but then what? Anyone you’re hoping will take the G needs to use the A/C or E/M eventually, neither of which can add *trains* and neither of which has much room on existing trains (A/C have some, but not enough). J/Z probably don’t solve any problems because of their Manhattan destination (anyone going above Delancey needs to pile on the F or M anyway, or continue to Fulton for something else). The M is the only hope, and a lot of L riders West of Myrtle are likely best served by starting their trip riding backwards for the M.
If you check out the recent A/C Line report, it’s clear that there is some room on the existing A/C trains that move through Cranberry. Obviously, we don’t want to be at 100% of guideline load, but you could absorb a few thousand additional riders on the A/C lines at peak hours. The problem is that the A/C is too far to the south for Bushwick/Williamsburg riders. Presumably, the G gains a transfer at Broadway to Hewes St. You’re going to need additional service on both ends of the M. Believe it or not, most of the M line actually could accommodate additional trains, but it’s going to increase issues with merging delays. 53rd is operating fewer trains than it did before the opening of 63rd. The QB local tracks could accommodate more trains if we could get the terminal at 71st to turn them around quicker. This is going to require everyone working together, but it can be done. The only trains that have room through Cranberry are the odd A trains that happen to have never met a C across the platform, and also don’t meet a G at Hoyt. I’m a daily A train rider and was a bit confused about what they A study concluded in that regard, except they did note that loads were uneven due to G transfers for some trains, and not for others. As a regular A rider myself, A gets overcrowded when it has too large a gap between trains. I usually see 3-4 A trains get bunched: the 1st is packed, the second is crowded. The third has a lot of room, and if there is a fourth, it probably has some seats available. The statistics tell the story. -R179 5 car sets should be delivered first and also placed on the C.
Of course, the bigger issue is that the A/C are not going to field the bulk of L riders. 50 pax per bus? Wut? Is this a Greyhound? One bus holds roughly 1/3 of the number of people as a subway car. So that’s somewhere in the neighborhood of 25 buses per train. At 22 trains per rush hour, that’s more than 500 buses an hour to meet demand. There would need to be a dedicated bus only lane for the entire route. A dedicated bus lane can reliably operate a bus every minute or 60/hour. Two lanes can operate 180 buses/hour (I know it seems weird but it’s true). If they had two lanes and used articulated buses, they could move a good chunk of people. Doesn’t have to completely replace the L’s capacity as a lot of people would switch to the G or M or whatever. I think that shutting down the L full-time during weekdays is out of the question. Maybe for brief stretches during less busy months, but there is generally way too little spare peak capacity to replace 20 full tph without incredibly expensive bus bridges or ferry service. Shutdowns every weekend is rough, but at least there is spare capacity to accommodate riders via the 7/E and M. A continuous bus bridge can also be implemented over the Williamsburg Bridge to allow for easier transfers to the F.
Recalling the days when the G train ran past Court Sq down the Queens Boulevard line: Would it be possible to have the G, which I believe connects with the F north of Court Square, run on the F train’s alignment to Manhattan? The 63rd Street tunnel certainly seems under capacity with only the F utilizing it at the moment. This wouldn’t just help alleviate the issues with this L shutdown, but creating a one seat ride to Manhattan for the G would, if possible without being prohibitively expensive, be extremely beneifical in the long run. NO! IT IS NOT POSSIBLE! Basically the alignment of the G-train tracks “going north” past the Court Square station is the follow the path of the E, M and R trains deeper into Queens and along Queens Blvd as a local train. The F-train tracks to/from the 63rd Street tunnel basically exist east of the Queens Plaza station thus they are in the wrong direction for G-trains to travel to Manhattan. There is simply no way and no where for a G-train from Brooklyn to make a complete 180-degree turn to head into Manhattan by any train tunnel in Queens. Or look at the track layout in the following way. Imagine that one if traveling west on a train toward Manhattan on the Queens Blvd line. Once past the 36th Street local station, that train could take track switch leads for the 63rd Street tunnel to travel to Manhattan – what the F-train does daily. Or that train could proceed into the Queens Plaza station and then be presented with three options: that train using or switched to the express track could travel along 53rd Street into Manhattan – both E and M trains do this regularly. Or that train once at the Queens Plaza station using or switched to the local track, and then again switched for the 11th Street Cut would use the 60th Street Tunnel just as the R-train does daily. Or that train once at the Queens Plaza station using or switched to the local track – remains on the local track for the trip down the G-train line to Brooklyn. Those are the 4 options for any and all trains traveling west on the IND Queens Blvd line, in the Manhattan direction. In the east bound direction, all of the tunnels – G-train, 53rd Street, 60th Street, and 63rd Street – are oriented toward taking riders in the eastern direction toward south-eastern Queens. There is no way to take any train coming from any of those tunnels – have that train make a 180-degree turn in one movement and then to use a tunnel for a trip to Manhattan. That is just not possible. There’s a layover track directly east of Queens Plaza which was used to turn G trains around at one point too. Perhaps that can be utilized on weekends when traffic is light. Bringing the G-train into the Queens Plaza station only creates one benefit, a possible connection for G-train riders to use the 60th Street tunnel and the R-train. At the Court Square station, G-train riders currently have access to the 53rd Street Tunnel with the E and M trains, plus the #7 train for travel across 42nd Street. Bringing the G-train into the Queens Plaza station DOES NOT create a transfer to the 63rd Street and the F-trains. In addition that lay-up exists in the middle of the switch tracks for the 63rd Street tunnel, meaning that full-length G-trains would impact the travel of E, M and R trains through that area. In addition for G-trains to use this lay-up track it has cross from the local to the express track then to the layup track, and upon its return to the platform that train has to again be switched from the express track to the local track to return of the G-train trackage. Basically there are no superior benefits for the hassle of this kind of operation. Prior to the creation of the enclosed Court Square transfer station – there was a practical benefit for the G-train to travel to/from Queens Plaza. Now that the Court Square transfer station exists, there is little benefit to the hassles of dis-embarking riders and laying-up and then relying G-trains at the Queens Plaza station. You can run the G Trains local to/from QP or Roosevelt Ave, allowing riders from Brooklyn to switch to the E/F/M/R/7. It won’t be fast, but it’s a possibility. I don’t know where trains can turn around in Queens though. Yes, there are several options that are possible. There is a difference between possible and practical, as well as the difficulty of doing the possible and the practical within a given amount of time. This particular discussion started with a statement that was NOT POSSIBLE! The original poster wondered if G-trains coming from Brooklyn by way of the Court Square station could be turned and directed toward the 63rd Street Tunnel for a direct trip to Manhattan, basically making a 180-degree turn to do so. THAT IS NOT POSSIBLE! The idea of having G-trains travel from Brooklyn by way of the Court Square station on the Queens Blvd line toward Forest Hills, allowing the riders to change trains and transfer to other trains – is of course possible. That was the original pathway 24/7/365 of the G-train. The question with the G-train and the Queens Blvd line has always been that the majority of the Queens Blvd riders wanted and needed to travel to and from Manhattan over the decades. As originally built half of the trackage of the IND Queens Blvd line travels to Brooklyn (G-train), and the other half (E & F) traveled to Manhattan. Building the connection to the 60th Street tunnel for the BMT RR-train in the mid-1950’s (RR, EE, N & now R trains) to the Queens Blvd line, and the later addition of the 63rd Street tunnel – now allows those 20 or 30-trains per hour allowed on each track to be used to send trains to where the huge numbers of riders want to go. Is it possible for the G-train to travel Queens Blvd? Of course it is. Now how much of those 20 to 30-trains per hour budget do you wish to spend to do so? I’m not sure I understand. You’re saying none of these options are possible because you can’t turn a train around while in revenue service? Why not? It’s a short-term rerouting. Let’s get creative. Couldn’t you place drivers at both ends of a train? Or better yet, have drivers switch out (and skip one train) at the turnaround station, so the train doesn’t have to wait for the drive to walk the length of the train while it’s in the station. The G (or a temporary new route sharing the G route) could turn around at Queens Plaza and take the 60th St tunnel to Manhattan and 14th St / Union Square. Or it could continue to 36th and take the 63rd or 53rd St tunnels to 14th St / 6 Ave. There are quite a few options there. Why are these ideas impossible? Or am I completely misunderstanding the problem? You COULD do it but it would be a pain operationally. Plus service on the M and R would have to be cut back and would likely experience less reliable headways. And the only tunnel that has spare capacity is 63rd St which leads you to either the 6th Ave or Broadway lines, both of which are full up (especially once the 2nd Ave line opens and you likely have the return of the W to replace the Q in Queens). If there were a direct connection from the G to one of the tunnels it might be worth reworking things. But given passengers would spend just as much time (or more) going backward on the G in Queens before doubling back to head into Manhattan as they would simply transferring at Court Sq, it’s just not worth it. The one thing that MIGHT be worthwhile and feasible is creating a crossover at Hoyt-Schermerhorn so some G trains could run into Manhattan. But, again, you have a capacity issue with the A/C. It isn’t possible to turn at Queens plaza because there’s no track that the G could use to go from the uptown platform to the downtown platform without using the single layover track that Jeff mentioned above. There’s only one such track, both drivers would need to be on the train while it’s in the layover, and it would delay the E and M trains getting in and out of queens plaza while it’s there. It would be a nightmare. The suggestion to build a spur to connect the G to the 63rd street tunnel, and running it to the Broadway line and down to Whitehall St, would make good sense. Running regular G service along that configuration might be worthwhile regardless of the state of the L train. You could also send it along sixth avenue and terminate at 2 Avenue like the V did. One point that some folks are missing is that a G-train that terminates at Queens Plaza in order to use the center layup track that is beyond the station – HAS TO BE CLEARED OF PASSENGERS BEFORE the train can enter that layup track! The train simply can not have riders on the train when it uses the layup track! So yes, that G-train could indeed enter the Queens Plaza (from Court Square) get switched from the Queens-bound local track to the Queens-bound express track to the layup track, reverse controls, then proceed back into the station on the downtown express track and then get switched back to the local track so that G-train can head back to Court Square. For all of that hassle, a train load of folks were just dumped on the Queens bound platform but what those folks really want is a Manhattan bound train! Those folks now have to use the stairs to the Manhattan bound side of the station to catch what? The E & M trains to Manhattan which could easily be done at Court Square? The R-train to Manhattan using the 60th Street tunnel – yeah sure. The F-train to Manhattan – why? That’s what the M-train is for! The Court Square station also has the #7 train which means that there are two pathways to the Lexington Avenue line or the westside of Manhattan – making access to the R-train less likely to be heavily needed. Now while some folks are trying to suggest routing G-trains through Queens Plaza as some kind of solution – they are not remembering the history of just why the G-train now terminates at Court Square, and the changes to that station that made it a transfer station. In addition some folks somehow think that the MTA is going to allow G-trains to wrong-rail and then “back up” on the downtown express track in order to reach the 63rd Street tunnel – all in the path of E and F trains running about every 2 minutes apart in the direct path of such G-trains – are talking pure fantasy!! Or that they have not closely examined the track map to truly understand why what is being suggested will simply not happen, ever. In what universe is the ridership on the G-train ever approaching the ridership of the E, F, R and M trains to ever think of negatively impact the movement of those trains? Even with new added L-train riders? There is a big difference between something being “do-able as an idea by just looking at a track map” and the real world. In the real world it is simply not possible to get G-trains over to use the 63rd Street Tunnel given the current tunnel and track arrangements, and the level of train service provided now. In the real world – it is simply not possible to build a new set of track pathways that connect the G-train from Court Square to the 63rd Street tunnel in a timely cost-effective manner given the huge amount of under-pinning and construction work needed to create such tunnels, especially under very active railroads! The LIRR being nearby does not help either but complicates the situation. Have some folks forgotten the huge amount of work being done to have the LIRR use the 63rd Street tunnel to get to/from Grand Central Terminal? Have some folks forgotten what it took and what it cost to get the F-train off the Queens Blvd line to use the 63rd Street tunnel? I thought the goal was to help L-train riders travel to and from Manhattan easily while the L-train 14th Street Tunnel is closed for Sandy Repair for up to 3-years? When faced with difficult circumstances, sometimes it is helpful to find an unlikely solution by thinking big. If the G connection to use the 60 or 63 tunnel could be built in two years or so, with moderate disruption, perhaps the L work could be delayed until then. Will it realistically happen? No. Should it be part of a long term capital plan *anyway* just because it would be of substantial benefit to G riders regardless of work on the L? I don’t know, maybe. Probably not, because it would cause all sorts of other problems. But it’s still a good idea. Is it that bad to think big? Exactly. I’m not sure whether the G to Manhattan connection is warranted, as the whole point of the G is to avoid Manhattan. A project like extending platforms on the M line should be doable in a year or two, all things considered. That would be an automatic 25% capacity increase on the M, which will be extremely valuable when the L closes. There is plenty of room to build a new track connection between Court Square and 21 St-Queenbridge, connecting the G to the 63rd St tunnel. It would be complicated, going under buildings and possibly the Queens Blvd line, but there are no geometric restrictions. It might be a good idea to build a track connection to do that though. I noted this on Twitter to Ben yesterday… Why ISN’T there a connection that allows the G to run into Manhattan? Looking at the track maps, it’s almost as if they intentionally built it so that it couldn’t. A simple crossover at Schermerhorn would make it possible but it doesn’t exist. A connection would be a bit more complex on the northern end but when they were building the IND it seems like it would have made sense to connect it to the 53rd St tunnel. Track capacity on those connections today of course would have to be considered, but at least there would be better options as an L alternate. Curious if anyone has any theories or actual knowledge about why the crosstown was built that way. I believe the G tracks do technically connect to Queens Plaza, and on to 36th. The issue as I understand it is that trains would have to turn around, putting a dent in dwell time that would hold up other trains, but I don’t see why we can’t look at creative solutions to that for a temporary service. Why not have a driver at the other end of the train ready to go? There are ways to do that, right? Along those lines: why not combine the R and the G, i.e. as the R leaves Manhattan it stops at Queens Plaza, then reverses direction and continues on the G route to Brooklyn. To replace the lost Queens Blvd service from the R, you could add a new line, using Broadway, the 63th St Tunnel, and Queens Blvd local tracks. Absolutely. With motormen at both ends, G trains can turn around at QP into the R tunnel to Manhattan. There’s another improvement that would be inexpensive and of permanent value: build side platforms along both J/Z/M tracks on the Williamsburg bridge, with station entrances via elevators on Bedford and Wythe Avenue. Sorry, I should have clarified. A connection that doesn’t require reversing. It might be possible to reverse lines, but I’d imagine it would be tough during rush hour. Such a complex routing has the potential to really gum things up when frequencies are higher. -Redundancy for L train riders for this project and in the long term. Terminating it at 2nd Avenue is possible. But the sixth avenue line already has heavy service, especially since M service would be expanded. Another possibility would be to send the G through the 63rd street tunnel, along the broadway line, and terminate at Whitehall like the W did. I favor that idea slightly, because it would equalize capacity a bit along the Broadway and 6th avenue trunks, and because the G has poor connections to the BMT trunk lines in Brooklyn. I can’t think of any reason why either solution would cause any scheduling or tracking problems. It is basically a shuffling of services to transfer the free capacity in the 63rd St tunnel down to the 53rd street tunnel where it is useful. Just add 2-3 more M trains and be done with it. The MTA would dig up 14th Street west of 8th Avenue while the L line was shut, and install tail tracks. Tail track don’t need anything other than to exist. Not signals, power, ventilation, anything… because ideally trains would never go there. But they allow the signal system to allow trains to come into the station faster, because an out of control train could be stopped by the last signal before hitting the wall. I’d think the 8th Ave. tail tracks could be added without a major shutdown elsewhere. They should do it now anyway. How does ridership on the L compare with the entire LIRR? From 2001 to 2002, New York City transit and its contractors completely rebuilt a mile of subway — signals, power, everything — after 9/11 in less than one year, starting from design. Under budget. For once, the whole ripoff edifice should be suspended. This isn’t one mile, it’s one block. And then afterward, run 30 trains per hour rather than 20, with half relaying at Myrtle. True but from a PR/political perspective it would mollify people somewhat if the MTA promised expanded L service when the rebuild was complete. The two technically have little to do with each other but it would give cover to an (unavoidably) bad situation for commuters. Right, not complaining. It’s something that should have happened a while ago. That’s a great idea. I had assumed they would keep the L running within Manhattan as a shuttle, but I guess that’s not totally necessary. Actually that’s a good question. Could they keep it running in Manhattan if there’s no access to a yard? There’s also very little space to lay up out of use trains, though I suppose you could use some of the Manhattan side of the tunnel for that assuming the heavy work is further down under the river. You could in theory, if you don’t offer revenue service in either tunnel, but keep one open either as a layup zone or to get trains to/from the Canarsie yard while you work on the other tunnel. Question from an ex-Californian: Storms rain freshwater. The tunnels end well-past the East River shorelines and water tables. So how did they fill up with seawater- holes in the tunnels under the river; flooding of the rivers/bays far enough ashore to spill down the subway stairs, etc? I’m from Sacramento where we had floods from heavy storms and crested rivers and backed up sewerage, but I can’t grasp what Sandy did here. Help? The storm surge from Hurricane Sandy pushed into the harbor, flooded low lying areas, and poured salt water down a bunch of vents (and sometimes stations) into the tunnels. The flooding went way inland. That’s why it was such a disaster. The storm surge was 10 feet higher than high tide in New York City. The Storm surge, which coincided with high tide raised sea levels significantly. So sea water pushed several blocks inland, then poured down entrances to the tunnels and filled ’em up. Also key to understand here is that the East “River” is not really a river, it’s a tidal estuary connecting New York Harbor with Long Island Sound. The water in it is not quite as salty as the ocean but it’s not fresh either. Even the Hudson, which is more of an actual river, has some level of salt in it up as far as Bear Mountain or so, and remains tidal all the way up to Troy. This is why New York City grew to such prominence: in an era where ships were the predominant means of long distance travel, it sat atop a harbor with naturally deep waters at the mouth of a river that was naturally navigable up to nearly 150 miles inland, and provided the only means of crossing the Appalachians between Georgia and New Brunswick that stayed at a low elevation and avoided having to climb over mountains. Build a new, parallel two-track tube ASAP, into which the ‘L’ service can be diverted. Then fully rehabilitate the existing tunnel and use it for the increased services that are badly needed even today [after new lines in Brooklyn and Manhattan are built to feed it, of course]. This is an analogue of the ‘Gateway Tunnel Approach’ to Hurricane Sandy damage, and it would cost money, so it’s not going to happen. If you’re going to build another East River crossing, you’d probably want to do it east of 2nd Ave. to the old South 4th St. shell. Building L train redundancy via 14th St. won’t work for a number of reasons. Would a replacement tube cost significantly more than the shutdown/rehabilitation? No doubt that a new subway line connecting at 4th street would be more efficient transit planning, but that’s fairly unlikely any time soon. Doubling the L tunnel capacity and sending a branch into Queens parallel to the BQE (also never gonna happen, but we can dream) would make more sense to me. Such an alignment would serve only to replace the Williamsburg bridge. During situations like this, non-revenue track connections could have been a life saver. For instance, if the L had just one connection to something else in Manhattan, 14th could have become a peak direction tunnel. Instead, there’s no possibility of going that route, because you can’t send that many trains into Manhattan with no way back out and no storage yard. Because the designers decided that building infrastructure that would be used once a century was a bad idea. As far as they knew the autogyro buses would be landing on the top of the Chrysler Building and Rockefeller Center, connecting to the El that ran along the 60th floor. Only 80 years overdue! I imagine the L tubes could hold out long enough. It would serve far more people than the vaportrain to Laguardia, even if that condensed into non-vapor. I’d be tempted to suggest the waterfront light rail idea be implemented from 59th and Lex to the Williamsburg Bridge with a stop at Lorimer or Bedford, but unfortunately I doubt NYC could do that in the time it takes to just do a shutdown. That covers most of the Midtown East access problems L riders would face, and would be useful in its own right. Serious question here, not a snarky one: How come it would take so much longer to repair the L train tunnel vs. the R’s Montague Street tunnel, which was repaired in about eight months, if I recall correctly? Wasn’t the surge situation in lower Manhattan far more severe? I like Ben’s ideas, but it will hurt even if all seven of them are implemented. There’s no way around the fact that this is going to hurt. Also, I can’t begin to imagine how Pat Kiernan’s idea would work. The Montague tubes took almost 14 months, not 8. And the three year proposal is if they shut one tunnel down at a time and did the work piecemeal. A full shutdown of both tunnels for 24/7 work would take a projected 12-24 months, similar to the Montague project timeline. You’re right. I don’t know why I remembered 8 months … especially since I walked right past the station every day at the time. Sorry about that. L train though serves more riders than any other East River crossing? That’s hard to believe – even more than 53 St? If you factor in nights and weekends, definitely. If that sounds like it’s hard to believe, that’s because it’s not true. For special mention, the Manhattan Bridge tracks carried 97,682 and 99,137, so combined, they also carried more than 14th street. There’s a lot of capacity available over the Williamsburg Bridge–even at rush hour, there’s still often five or six minute headways between M, J and Z trains (ask me how I know…). The problem is that there’s not a lot of spare capacity on the 6th Av local, where already there’s 1 M for 3 Fs during rush, and they’re pretty tight. So there should be a slight increase in M service, but the MTA should consider adding a ‘K’ service that would follow the pre-2010 routing down to Broad St, which would allow M service to double. Then supplement it with shuttle buses that run express from each L station between DeKalb and Bedford to a corresponding J/M/Z stop. How would a K line running from Myrtle to Broad help anything? It’s not like the Myrtle Av branch is the bottleneck or that the Nassau St branch is in heavy demand. The problem is that where the M and J/Z merge at Myrtle, the outbound M has to cross over the inbound J/Z to get to the Myrtle branch, limiting capacity to 18 trains/hour. It kills inbound capacity when you have outbound trains going to Middle Village. The idea of a dedicated busway across the Wburg Bridge is intriguing. Could this be the excuse we need to finally construct a proper BRT route in the heart of the city and demonstrate its utility? The emergency nature of the project and the fact that it would be sold as a temporary situation could be enough to overcome the usual opposition to taking lanes from private cars. But once it’s up and running people discover that: real BRT actually works wonderfully for passengers. Drivers redistribute themselves and there’s no significant adverse impact on traffic. You could see such a setup becoming permanent, even after the L restoration, despite the inevitable bitching about broken promises. But opponents would find it difficult to argue with statistics showing that the buses actually work. It could be the crack in the dam to unleash support for other stalled BRT projects. What’s this obsession with proving BRT “works”? It has been working fine for years on First Avenue. It could be improved there, but has certainly works. Several cities have BRTized bus corridors, many quite successfully. It works. But in this case, there is no path for replacing the L Train with BRT. No long, straight, wide boulevard between 14th Street and Bedford Avenue. The conditions that typically allow BRT to work aren’t there, and buses have a marginal role to play in replacing the service here. Most of the traffic will need to be dispersed across other subway lines. Full-fledged BRT includes physically separated travel lanes and prioritized signals — something which has not yet been implemented in NYC, largely because of DOT meekness in the face of opposition to loss of space for private autos. Any number of streets in Williamsburg could support a dedicated bus lane if you eliminate a curbside parking lane – you could potentially have the route running eastbound and westbound on adjacent avenues, to avoid eliminating all on-street parking on a single road. The routing on the Brooklyn side would change after the tunnel restoration, when the function of the route would shift from replacing L service to augmenting it. And crucially, dedicated bridge lanes could serve as the Brooklyn-Manhattan transfer point for any number of routes. Why should we implement BRT following the route of an existing heavy rail line? I just don’t understand why people will want to ride a bus across a bridge when there’s already a train that does this. We must prove buses are a viable form of transportation, even where they’re not. Prove it, or die an agonizing, fiery death. If the train is already full – like the 4, 5, 6, E, and L into Manhattan – then a separate bus lane would be a useful supplement to the train. Not really, because very few people are going to trade out the quicker train for a slow bus ride. No. The Institute of Transportation and Development Policy did a report rating BRT systems throughout the united states on their adoption of BRT features and the effectiveness of those systems. They rated SBS in New York, and the Silver Line in Boston as “Not BRT”. They don’t own the term BRT, and the concept predates their work in the area by perhaps decades. SBS has some issues, but it’s certainly BRT by most people’s definitions including the Federal Transit Administration’s. Fine, call it BRT or not as you like, but the last time I checked SBS doesn’t have signal prioritization or separated lanes. Why not? Those are major things, particularly separate lanes. I thought SBS was supposed to have both of them though, at least on part of the routes. SBS has signal prioritization at five or six individual traffic lights in the Bronx. First Avenue SBS has no signal prioritization at all. Effectively SBS does not have signal prioritization which is a major component of all BRT systems. SBS has, to my knowledge, absolutely no physically separated lanes. It has separate lanes. While physically separated lanes are not required for most definitions of BRT, virtually all BRT systems in the world outside of the US have them on at least significant portions of the route. Enforcement of traffic in BRT lanes is slightly improved from four years ago but still not great. BRT is an inferior technology worth of third-world cities. It should be rejected the same way we reject discharging untreated industrial effluents into rivers. I wish there were some federal action to stop funding of any new BRT that relied on federal money and that BRT projects were preemptively excluded from consideration for TiGER grants and the like. This is probably too pricey, but what would it take to build a connection between the L and the G? If the L could be temporarily rerouted via the G to Queens Plaza and/or 36th, that would help tremendously. Wouldn’t a connection between the L and G be advantageous to have around for future temporary reroutings anyway? Lots of underground utilities (of which not all may be mapped) which would have to be relocated, demolition of the buildings on the western end of the block at Union/Metropolitan (to allow for, even then, a really tight curve radius), all causing huge, costly disruption for absolutely tiny benefit. Here’s how I predict the one-track option would work. “L trains run in two sections: from 8th Ave to Bedford Ave, and from Bedford Ave to Rockaway Parkway. Trains stop at 3rd Ave in the peak direction only.” This works with departures every 10 min on the 8th Ave – Bedford part of the train. Morning departures, eastbound — 8th Ave, 7:02; 6th Ave, 7:03.5; Union Square, 7:05 min; 1st Ave 7:06.5 and every 10 min thereafter. This uses two trains, with trains waiting for an extra 2.5 minutes at 8th Ave. The single track from Bedford to 3rd Ave is occupied westbound from 7:00 to 7:05 and eastbound from 7:05.5 to 7:10. The 3rd Ave stop is peak-direction only to relieve part of that crunch; alternatively the departures might be every 12 min instead. It’s actually explained in the link that a single tunnel could operate on 12-minute intervals as follows: Trains #1 and #2 depart Lorimer and Bedford simultaneously, respectively, and run express to Union Square / 8th Ave. Trains reverse simultaneously and return express to Lorimer and Bedford respectively. 10 tph in each direction, so half capacity. I’d imagine there would be a shuttle on the other tracks btwn 1st and 8th Aves. 3rd Ave would probably be shut down since Union Square is nearby. I think my proposal is closer to what the MTA does and would do: this adds at most one transfer to commutes, allows Bedford Ave riders to go east, and uses the interchange which is available to turn trains around at Bedford but not at Lorimer. I’m using the track diagram at http://www.nycsubway.org/perl/.....east_2.png. Under the two express shuttles proposal, Canarsie trains would run to Bedford, reverse and return to Canarsie. Express shuttles would use the other track at Bedford, and while the Lorimer express shuttle would share a track at Lorimer St with the Canarsie service, minor scheduling tweaks would make this not too much of a problem. All of the above proposals should be used, but in addition, instead of running the MTA’s typical shuttle bus substition (which seems like it must be extremely expensive and inefficient anyway), use this as the excuse to push through for an M14SBS route with off-board fare payment and camera-enforced dedicated lanes the whole route, with stops only at the subways, that runs over the Williamsburg Bridge to meet Bedford. The bus would then turn at N 7th onto Driggs to return to the city. Parking would have to be prohibited on one side of Bedford and Driggs between the bridge and N 7th St, but considering that the L is the most kvetched-about train in the city, one might hope people would accept its outage as being serious enough to warrant such a drastic step. The existing M14A and D, and the existing B62 on Bedford/Driggs would continue to make local stops, but the new SBS route would only stop at subway stations along the route. Turn the shutdown into an opportunity. There is only one other form of transportation that can carry this number of people. Walking. I think the Willie B bike/ped path has capacity. NYC should organize a gigantic weight loss effort in concert with the shutdown. Maybe bring back the K train as a super-express on the Jamaica line, terminating at Broadway Junction? Only two stops between Broadway Jct and Manhattan that way, and it could be sent up 6th Avenue or 8th Avenue as needed. Or crazy, almost completely impractical idea, but it doesn’t hurt to think big: cut the tracks, build a temporary pontoon bridge and bypass the tunnel entirely. This way, customers can transfer from buses to trains at Bedford Avenue, and then be shuttled to 14th St in Manhattan, where they can get back on the L from 1st Avenue, or simply remain onboard the bus. As this will improve service on the M14, a route that should be SBS regardless, and allow customers to remain onboard for service across 14th St, eliminating the need for two transfers that a simple shuttle service between 1st Avenue and Bedford Avenue stations would create, I believe this is the optimal solution. When the tunnels re-open, M14 service can be cut back to it’s original eastern terminus. This was always going to be the toughest Sandy pill to swallow. Ferries are nice, but at the end of the day, they are only going to help a limited number of L line riders. Also, there is no way anyone is going to be able to build a massive new piece of infrastructure between now and when this shutdown begins. So, I expect extra G service (whether that is longer trains or more of them, or both), Ben’s 24/7 M, and a Metrocard transfer between the G and the J/M line. People headed towards lower Manhattan and “the Valley” will opt for a J/M ride. People destined for Midtown will probably take the G to Queens. Hopefully, CBTC will allow for a boost in 7 service, and maybe some extra M service through 53rd will help out there. The remaining R32s dodge the scrapper yet again. These cars just keep rolling along. All we need to do is build a canal from the waterfront to Bedford and North 7th. The Winter for 2016 is terrible many track problems are arising we have lots plus to much passengers on trains. These create many problems for the IRT IND and BMT Lines. CBTC or not. Newer signaling or not. If tracks and tunnels aren’t repaired and fixed it will be a problem for the MTA. The water that freezes in the cracks have been expanding for awhile. A train can break a brittle track in a instant. Tracks can’t be wielded 123. People have to go places but the train stations need repair a 100+ year old system cant run forever without maintenance. The MTA can’t rush to build a extension. People need to stop complaining about the subway. It is a 100 Years old. Newer trains wont solve the problem. The solution to the problem will be to allow them to fix the station. This is the 21st century if we even had more subway extension more people would complain about this. What if 10-car trains are run on the L, at least on the express shuttles (Bedford-8 Av and Lorimer-Union Sq)? The platforms are 540′ long I believe, so they’d easily fit nine cars, and they can fit ten if the first two and last two doors of the train are cut out. Bam, capacity increases by 25% with no additional train service. I’m just curious, in this “double express shuttles” plan, what does the Bedford-8av shuttle connect to on the Brooklyn end? Regular trains from Canarsie will be terminating at Lorimer (and how this service is relayed without interfering the the shuttles is not made abundantly clear). So in theory, everyone can walk over to the shuttle platform and wait for the Lorimer-Union Sq shuttle. But how do they get from Lorimer to the Bedford Shuttle? It sounds like we’re running this shuttle just for the Bedford riders, which is not enough. I think we just want to single track service through one tunnel. It might make sense to double up peak direction trains and maybe even skip 1st and 3rd in Manhattan. 10 car trains might help a little, but there is no clean solution to this problem. I’m guessing that Canarsie trains would terminate at Bedford (the side where the tunnel will be closed) while the Man-Bklyn Shuttles pass. However, when the Lorimer-Union Sq shuttle passes Bedford Av, Canarsie-Bedford trains will have to wait until it empties, refills, and passes Bedford in the Manhattan-bound direction before trains can continue the relaying process at Bedford. Canarsie trains will run to the closed-tube track at Bedford and reverse there. The 8 Av shuttle will reverse at Bedford, while the Union Sq shuttle will reverse at Lorimer, on the open-tube track, while not interfering with the Canarsie trains. It would mean some juggling and service reductions on the Canarsie service for sure. However, the crossover is between Bedford and Lorimer, which means that the Lorimer-Union Sq has to pull in and leave before any train from Canarsie terminating at Bedford (on the closed-tube track) starts to return to Canarsie (unless you are single-tracking from Bedford to Myrtle-Wyckoff, which is where the next crossover is). Yes, the Lorimer-Union Sq shuttle will share that section of track with the Canarsie service. The shuttle will run every 12 minutes, however, while the Canarsie service will probably run approximately every 6 (or 50% of regular service). Should be sufficient. For the record, that’s not what Pat Kiernan’s proposal stated, but your idea is pretty sound in my opinion. The trick would be getting people to understand exactly what is happening at the whichever Lorimer Platform happens to be serving both the Union square shuttle and Canarsie trains. Assuming the tube is fully closed: shuttle buses from each L station between Myrtle and Bedford direct to the nearest JMZ stop would be called for. The fewer transfers, the more appealing the options are. You could also beef up service on the existing routes that connect the (L) to the (J)(M)(Z). Maybe add some limited-stop service as well. A crucial point that I haven’t seen brought up yet here- the single transfer passageway between the Manhattan-Bound L and the G at Metropolitan Ave is narrow (2-3 people wide I believe), with stairs, sharp turns, and little visibility at corners. It feeds into a sharp downhill ramp and an equally narrow passageway to the L in the other direction. Lines already form on the (shallow) platform for people transferring off the L and heading into this passageway- it’ll be much worse if mass numbers are transferring off to the G. With bidirectional pedestrian traffic through that tunnel- we’ll be talking about a 100-foot, crooked, long two-person wide bottleneck. Imagine hundreds of people grouped on the platform waiting for people to filter down the steps and into this narrow passageway. Imagine people trying to walk out on the platform coming from the either way, into this crowd which has gathered right next to the train pulling out of the station. Imagine elderly, overweight, disabled or bag-laden people, and children, filing into this passageway (where they can’t see the exit until they’re at the very end). That hallway can’t handle that kind of capacity and would be a huge safety liability. Add as many cars on the G train as you like (and up the frequency while you’re at it), there’s no getting around this bottleneck, unless there’s another passageway I’m not aware of. If transferring mass numbers of people onto the G is part of their solution, they’ll need to either 1) post staff at either end to do crowd control and direct traffic (and they’d probably need metal barrier fences too), allow for an out-of system free transfer above ground (and back into the primary G entrance), or break out the shovels. I don’t see the last one happening… what about the others? What would probably end up happening is that the passageway would be closed* and a direct above-ground route made available, with the emergency gates kept open on both ends. *If it is left open, everyone will try to use it. Closure is more effective in this case. When the 53rd/Lexington Escalator replacement project was performed, the transfer between the 53rd st lines and the Lex Local was made a one-way transfer. Perhaps something similar could be done here. Bus shuttle to Marcy Av from Bedford and Metropolitan/Lorimer Avs. Depending on the terminal capacity of Canarsie, some J-trains run from Chambers to Canarsie at all times. Increase the service frequency of M-trains. To accommodate work being done at Bedford, trains could terminate at Lorimer and proceed empty to Bedford some weekends and weeknights. Yes, the L-train has plenty of riders but understand that a permanent closure of the tubes will be better than a single track procedure. With the Monatgue Tube closure, that project came in early and was under budget with a full closure. If the MTA can do a full closure of the 14th St tubes and also come in early, under budget with the station renovations at 1st and Bedford, within 2 years, that would be beneficial to all riders than a partial closure that makes work stretch for 3-4 years. So, although none of us want a full closure with this type of ridership on this vital link to Willamsburg and Bushwick, a full closure will have a higher efficiency than single tracking. There are four closed staircases at the Metropolitan Av G station; three of them could easily be re-opened. There’s one on the southeast corner of Union Avenue at Grand Street. Another is located at the north corner of Union Avenue at Hope Street. The final one that could be readily opened is across the street at the north corner of Union Avenue at Powers Street. Re-opening these staircases would expand access and allow for easier egress. Can’t some L trains be sent over the J/Z from Broadway Junction? Could give some amount of L riders direct Manhattan service, albeit to Broad St (or to transfer). That track configuration is easy, but it is already be easy enough for riders between Broadway Junction / Canarsie to transfer at Broadway Junction. And the bulk of the ridership is not along that part of the line. -Middays, there will probably be no service increase for the J/M services at that time, and people will be forced to crush onto the trains that are already provided. IF and ONLY IF they’re lucky, they might bump up the J/M train service to 8 minutes rather than 10 during middays, but not likely. -Weekends, the M train will likely be extended to 47-50 Sts like it has been done when the L has been suspended between Manhattan and Brooklyn previously. DO NOT expect there to be a sudden expansion just to accommodate the L train people. As for the G train expansion, the length of the G trains should be doubled to the full length trains, so that customers can transfer to Manhattan trains at Court Sq or Carroll St.
2. Take the Church Av-bound G train. Transfer from the G train at Carroll St to Manhattan-bound F trains (the F train in that section of Brooklyn can handle the ridership there too). 3. Take the Church Av-bound G train. Transfer from the G train at 4 Av-9 St to the R train (A LOT of EXCESS Capacity there). 4. Transfer at Hoyt-Schermerhorn to the A/C trains. (already suggested in previous posts). Its just that people are LAZY! there are options, people just have to find them and not expect solutions to be planted at their feet. I prefer not to do this, but if you can’t provide additional context to your repeated remarks or refrain from unfounded personal attacks, I’ll have to revoke your commenting privileges. This comment is mainly about a strategy to increase capacity on Broadway line over Williamsburg Bridge (2nd paragraph). – Rebuild the old upper level station and track at Myrtle and terminate the M there, Middle Village-Myrtle only. This short M would run at much higher frequency than current M, like every 4 minutes. It only takes 12 minutes to get from Middle Village to Myrtle so you’d only need like 7 or 8 six car train sets. This also allows for smoother operations in perpetuity when the M terminates at Myrtle. – J/Z trains run on express track from Broadway Junction to Marcy at increased service (at least 15 trains/hour). The occasional J/Z train may have to terminate at Bway Junction if Jamaica Center can’t handle over 12 tph. – New ‘K’ trains run local over Canarsie, Jamaica local, 6th Avenue local, effectively replacing M in Manhattan all the way to Forest Hills. Unlike at Myrtle, there is a flying junction between the Canarsie and Jamaica lines. This would be about 10 trains/hour, better than current M. I’d assume almost all 14th St Tunnel L train riders from Broadway Junction to Canarsie would switch to this. – Increase bus service north of Broadway on B32, B62, B24, B57, B38, B52 and B20 to encourage people to use this improved ‘K’ service. Better G service with a reopened Hewes St exit and free transfer from G at Broadway would draw riders from Greenpoint and North Williamsburg, and certainly Bed-Stuy/Clinton Hill area.